The bitter I brewed a couple months ago is definitely over-carbonated. Both the bottles and the Party Pig are excessively foaming. I haven't noticed any off-flavors in the beer, so I'm thinking I must've just goofed and added too much priming sugar and/or the beer wasn't done fermenting. It's disappointed, but at least the beer is drinkable. It just requires some patience. Yesterday I brewed up a sort of Belgian Pale Ale using mostly Northwestern Gold LME, some crystal malts (20L and 80L) along with some Spalter and Czech Saaz hops. I pitched Wyeast 3787 Trappist yeast at about 73 degrees. The kitchen is always warm, so I decided to surrender and brew a yeast that is more tolerant to warmer temperatures. I'm not sure why I even try to brew English style bitters in my kitchen; they always turn out really fruity with a ton of esters. Nothing off-putting, just lots of fruitiness. Certain Belgian yeasts, like the Wyeast 3787, seem to be able to tolerate the heat better. I've had pretty good look with dry yeasts, too, especially SafAle S-04 and S-05 which seems to ferment fairly clean up into the mid-70s. So maybe dry and Belgian yeasts are what I should use instead of trying to brew the perfect bitter in a warm kitchen? The Wyeast 3787 seems to be starting kind of slow, but I'm not worried about it. I've got pressure in the fermenter (the cone of the airlock is pushed all the way up), I just don't have bubbling going on yet...except in my over-carbonated bitter! Several years ago I started a fascination with American brewing history and some of the great American brewers of the past. I started collecting glassware and other memorabilia of many of these old brands of beer such as Ballantine, Falstaff, Pabst and Schlitz. Some of these beer brands survive, but most of these names have been consolidated under one corporate entity. Pabst Blue Ribbon is probably the most popular "retro" American beer brand and the modern day Pabst Brewing Company owns several other old brands such as Blatz, National Bohemian, Olympia, Old Style, Pearl and Schlitz among others. Schlitz is probably the next bigger sellers among the old brands in the Pabst portfolio. 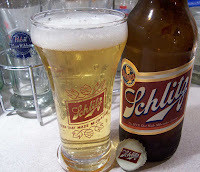 This brand has an interesting history, at one time during the 1970s Schlitz was the second most popular beer in the country. It's reputation was built over many decades starting in the late 1800s building upon a system of tied-houses to promote and sell it's product. Some of these tied houses still exist. One of these structures (that I've been to) is now Schuba's Tavern at Belmont in Southport in Chicago. Unfortunately, the market share for Schlitz started to collapse in the late 1970s and early 1980s when the company tinkered with the recipe. Some of these changes resulted the beer actually turning to glop -- an ingredient added to increase head retention and foaming apparently caused the beer to start to solidify. Other ingredient changes were known to cause headaches in some people. A strike in the early 1980s didn't help the company either. Remarkably, this beer brand has survived since then, brewed in smaller amounts by a couple different owners until recently being reformulated back to a 1960s "original" formula. Despite my interest in old beer brands I don't really find them that appealing to drink -- especially Schlitz -- which is why when Pabst announced a recipe change back to an old formula I was curious, thinking that maybe I'd like the new "old" Schlitz. I'm drinking a bottle tonight, of course poured in 1960s era pilsner sham, and it's not bad. That said, it's looks may be its best asset. The beer poured with plenty of carbonation forming a pretty white head that left lace on the sides of the glass as it slowly fell. Schlitz smells of grain and maybe a wisp (or I guess a "kiss" as the advertising used to say) of hops. The color of the beer is crystal clear and pale yellow. It tastes a bit grainy but gone is the corn and vegetal flavors. It's not quite as slick or smooth (or quite as sweet) as Pabst Blue Ribbon. I don't necessarily miss the sweetness, but I do miss the smoothness compared to Pabst. In fact, it may be a bit too grainy tasting for me, but I could see maybe trying it again in hot weather or when I'm feeling nostalgic and want just a little six-row barley malt and a kiss of the hops. Crap. I brewed another bitter last month and split the batch between several 22-ounce bottles and a party pig and it seems the pig is massively over-carbonated. Pure foam. I tapped it for the first time tonight and easily and quickly filled a liter-sized mug with 100 percent foam. I'm not sure what happened except that maybe because I batch primed that the priming sugar didn't evenly mix and the yeast in the pig beer had too much sugar to eat. The beer is also very cloudy which is unusual for a pig beer (the pressure usually seems to force the yeast out of suspension.) The beer smells fine; very neutral actually, and it tastes rather fruity with a sneaky bitterness that isn't too strong at first then sort of builds with each sip. I don't think it's infected, probably just overcarbonated (I mixed a half-cup of priming sugar to carbonate the whole batch.) I'm thinking that the next batch that I split between pigs in bottles I should probably cut back the sugar a little bit to maybe a third cup and see what happens or maybe I'll just get the parts I need so I can put a whole batch in party pigs. The other day I decided to support my local brewery. I picked up a mixed six-pack of two different beers from Two Brothers Brewing Company in Warrenville, Ill. They're both ales that I've had before and wanted to revisit after being less than impressed the first couple times around. I'm pleased to report that I enjoyed both beers, Prairie Path Ale and Bitter End Pale Ale quite a bit. Both ales are great examples of a session beer, at just more than 5 percent alcohol by volume, you can enjoy three or four of these beers and not feel any effects the next day. Prairie Path Ale is the lighter of the two, both in color and in body. The golden ale (as described on the label) pours with a good initial flourish of carbonation forming a brief head that quickly falls; not the prettiest beer, but that's okay. It smells good (spicy, grassy hops and fresh toasted malt) and tastes great. It's a very crisp ale, with a good slightly toasted malt flavor accentuated by just enough spicy Saaz and Kent Goldings hops. The bitterness is just right and the finish dry enough to enhance drinkability. This not a terribly complex beer, but a very easy drinking, tasty beer. I really like the fresh, crisp malt flavor and slightly bitter (28 IBUs), dry-ish finish. The Bitter End Pale Ale is differentiated by its copper hue and more sustained foaminess that generates lace down the sides of the glass with each sip. This ale has a light aroma of more citrusy hops than spicy. The Bitter End has more body than the Prairie Path, too. Again, this beer is very fresh, which shows in its leafy, citrus hoppiness. Some will complain that it's actually not that bitter and that the hop flavor is muted, but I don't this beer is trying to be an IPA. I would almost consider to be more an English Pale Ale; the fairly full body is keeping me from downing this one as quickly as Prairie Path Ale, but the Bitter End has only a tenth of a percent more alcohol by volume. There is clearly some use of caramel malts in Bitter End and the help round out the flavor with the hop bitterness of 32 IBUs just assertive enough to coat the tongue a little more with each sip. Beer geeks and brewers: both these brews hover around a original gravity of 12-13 Plato. I think I'm lucky to have found these beer very fresh and in excellent condition for $8.49 a six-pack at my local Trader Joe's. Both ales have a best before date of June 10, 2009 which confirms their freshness. That said, I would definitely recommend consuming these beers as fresh as possible. Since the alcohol content in both isn't that high, I'm not sure how well they will age and I'm frankly a bit curious as to how they will taste in a few months, as it's the fresh character of both of these ales that's really got me interested.